Did someone just say, Healthy Bananas Foster Ice Cream?!? Bananas Foster + Ice Cream have officially been PUT TOGETHER?!? Quick, someone get me a hyperventilation bag. Anyways, I did my research and I learned that Bananas Foster is typically made with sliced bananas, LOTS of butter and brown sugar, and then some rum. I felt a little bit better about this unique ice cream flavor endeavor and got to developing the recipe. Surprisingly this trial was a success! I posted the recipe back in 2013, but felt like it could use a bit of work and simplification (I used a lot of ingredients and the recipe had too many steps… in case you wanted to check it out, I provided the old recipe in the “Notes” section of the recipe box below). In an attempt to simplify the recipe, I created a huge disaster. I thought it was a good idea to reduce the almond milk and increase the bananas and xanthan gum. I definitely didn’t use enough bananas because this “ice cream” wasn’t sweet at all. It was rock hard and icy too. Instead of using almond milk, I swapped it with my Vegan Sweetened Condensed Milk. What a good decision that was! It provided both a creamier texture and a sweeter flavor. Instead of using rum (I ran out), I decided to use bourbon instead. I also increased the amount of alcohol from 2 tbs to ⅓ cup. You still can’t taste it, but it makes for a better textured ice cream. After churning and freezing, I spooned myself a big bite, and guess what. 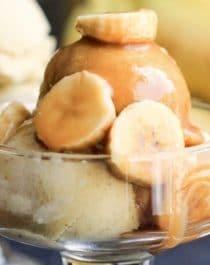 This Healthy Bananas Foster Ice Cream is so sweet, creamy, rich, and delicious, you’ll have a hard time believing it’s refined sugar free, dairy free, and VEGAN! In a small bowl, whisk together the cinnamon, xanthan gum, turmeric, and salt. In a blender (I used my Vitamix), add the bananas, condensed milk, bourbon (or rum), vanilla extract, and butter flavor. Puree until completely smooth. With the blender running, slowly add the dry ingredients. Puree until completely smooth, then increase speed to high for 30 seconds. Place the frozen ice cream maker attachment onto the stand mixer and turn on the "stir" speed. Pour ice cream mixture into the ice cream maker and churn until thickened slightly (it won't turn into ice cream just yet, this step is just to make sure the ice cream doesn't form ice crystals). Pour the ice cream mixture into a freezer-proof dish (I used a 9x5" ceramic loaf pan). Freeze until it's the consistency you prefer (~3-5 hours). Serve with Homemade Caramel Sauce and enjoy! 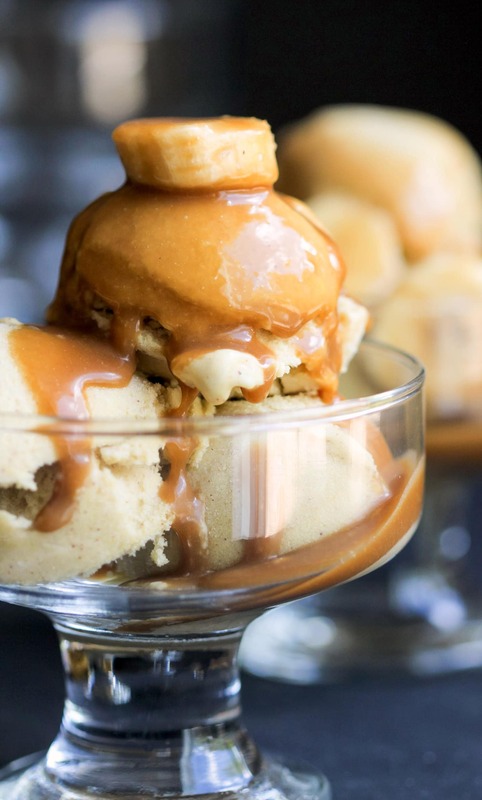 Watch me make this Healthy Bananas Foster Ice Cream! This Healthy Bananas Foster Ice Cream is the bomb. No one believed it was refined sugar free, vegan, and 100% healthy! Try it for yourself and you’ll see why. Refined sugar free ice cream with caramel sauce and bananas? I need an ice cream maker. I don’t have the patience to make the caramel sauce…do you think this would work with (thick) honey or maple syrup? Also…how might one make this if one does not own an ice-cream maker? Oh totally, I didn’t even think about that! Pure maple syrup sounds like a great addition to banana, mmmmm. I haven’t tried making this without an ice cream maker but the only thing the machine really does is incorporate more air into the ice cream for a smoother/softer texture. To incorporate more air into the mixture without the machine, I would recommend just whisking the “batter” in the mixer for a longer period of time (let’s say, 2-3 minutes in both step #5 and step #7). Imagine you’re making an egg white meringue, the longer you whip it, the more air you incorporate! I always know it’s one of your recipes in tastespotting/foodgawker because you’re the only person who still bangs the tired old “guilt-free” food drum. Seriously, every food is guilt free when treated appropriately. Boring. Give it up. And so glad you like the recipes, I’m totally glad to share them with people who appreciate them, like you! I love the caramel action shots! I am not quite legal to bourbon, but boy do I wish I could try this recipe! It looks absolutely incredible! Hey, it’s almost Summer where I live… totally would like to cool down with this little gem, looks amazing 🙂 Never heard of butter extract before – great recipe! Think I need to get myself an ice cream maker.